I have used a new document camera and I have to say I am a huge fan! The HoverCam Solo 8 is a wonderful addition to a classroom. Here is a short video that details all of the awesome things it does. 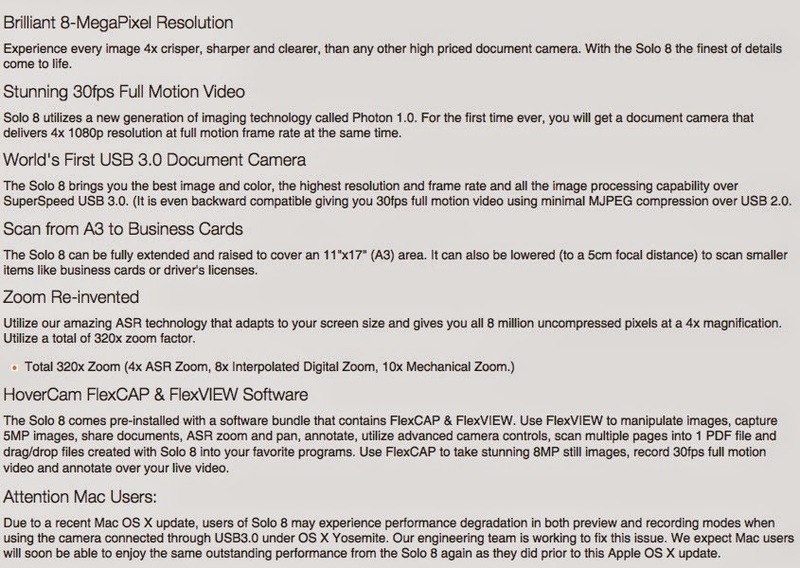 Here is a description of the Solo 8 and I'll talk about these different features. The pictures are simply stunning. The images are crisp. I am blown away at how wonderful everything looked under the Solo 8. Take a look at these pictures from their photo gallery. Check out their Gallery Photos for more great pictures. The Video Recording was smooth and the sound was clear. This can really change the way teachers flip their classroom. I can see teachers and students recording their annotations and then sharing them with the rest of class. Zooming was easy to use by simply sliding my finger up and down on my mouse and the auto focus made sure that the image was clean. 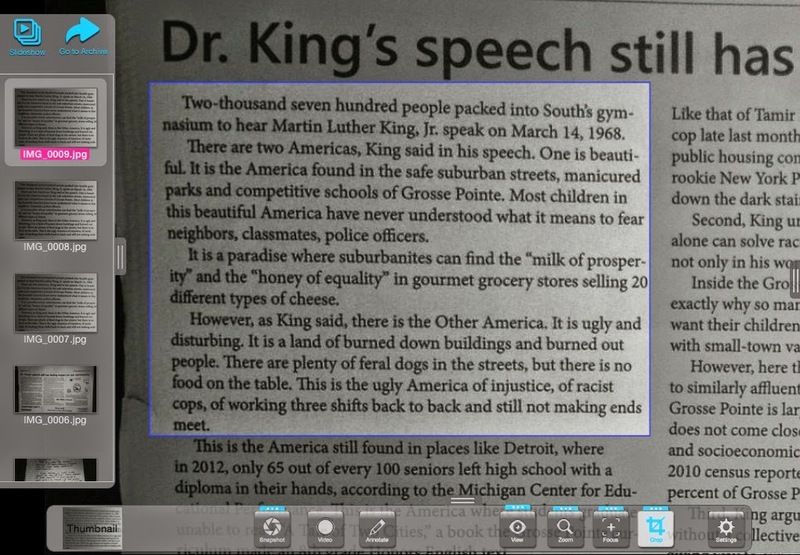 I would have to say that my favorite aspect of the Solo 8 is the annotation feature in the Flex 10 software. 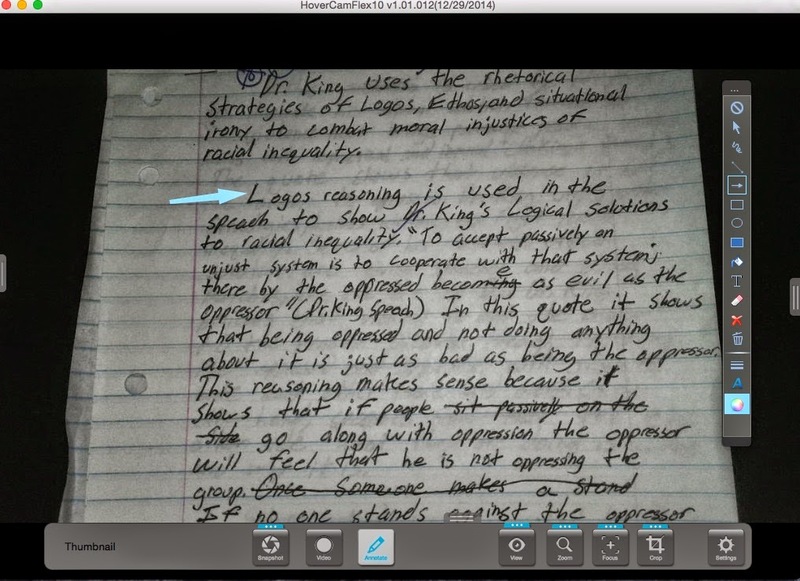 Here is a quick look at a student essay and the annotation tools. This is a screen shot of a live image. I was able to annotate on a live image. 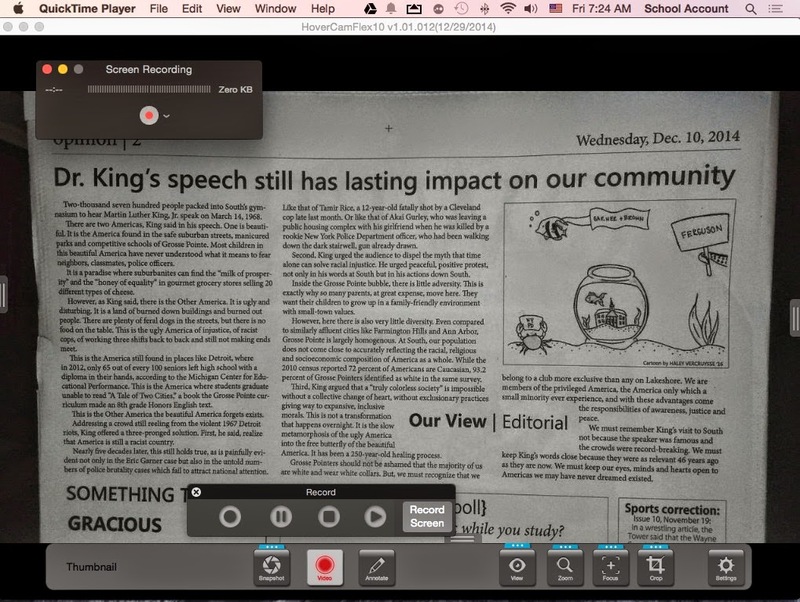 You can also annotate on the pictures that the Solo 8 takes, but annotating on the live image is important. As a teacher, you might want to show a class something, but do not need to take a picture of the document every time you want to show an example. You also might not want to actually mark up the paper. This allows you to virtually mark up the work for the class to see and you could snap a photo if you wanted later, but it is not required. This is the type of feature that sells document cameras. I also love the fact that the live shots did not have any lag. When I moved my hand or made notes, they were on the screen right away. Normally, other document cameras have that lag hiccup that just takes a second to catch up to what the user is doing. I did not experience that at all and I tried to make it lag. I wrote quickly, i waved my hand, and I even shuffled papers around. I did not see a lag and the auto focus was great once I stopped moving. These things are huge in a classroom where every second of instruction counts. Flex 10 software also allows for the user to crop the image that is being viewed to help focus on the relevant information. This is a crop of a part of an editorial from our school newspaper. This is perfect for teachers that are showing printed works and want to focus on only one aspect of a very busy page. Clarity is important and we have come a long way since the overhead projector. The fact the Solo 8 can do so much in one device is important for teachers looking for the most bang for their buck. The high resolution photos, the screen recording, zooming, cropping, annotating, and other awesome features make the Solo 8 an excellent choice for educators looking to add an document camera to their classroom. If you are looking for a new document camera that can do everything you want and more, check out the HoverCam Solo 8. They have a great 30 Day Trial that can help you see for yourself how this awesome camera can be used in your learning environment. It's what I did and I can't wait to get one for my Makerspace so students can see the detail for all of their work. 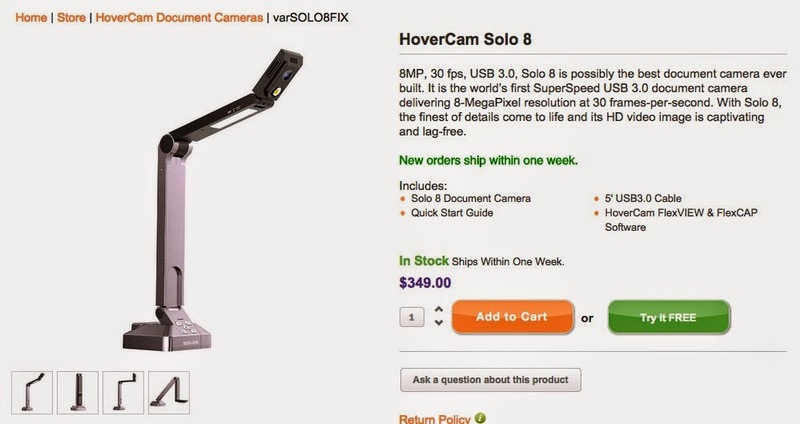 Check out the Purchase Info to get a HoverCam Solo 8 in your hands as soon as possible.